Any actions needed for internet security alert 055bccac9fec? I was on tweaktown.com when I got the security alert, I didn't get the message as soon as I wen't to the website, I stepped away from my computer with Firefox still opened, when about 20 minuets later I heard a guy speaking about a security alert, I checked and noticed that where my tab for tweaktown.com was, their was the security alert page instead, I right clicked on the back page button, and tweaktown.com was listed under tab history. I've gotten a similar message a couple of times before while reading a news article on yahoo news, and didn't pay much attention to it as I assumed it was just yahoo news. No software recently installed except for superantispyware which I installed after receiving similar messages on yahoo news, which scan found nothing, even Norton and malewarebytes found nothing. That is a fake ad, designed to scare you into calling that number. Then, they will extract several hundred dollars from you, to "clean" stuff that does not exist. So my computer isn't infected and it was just a hijacked add that redirected to that page? 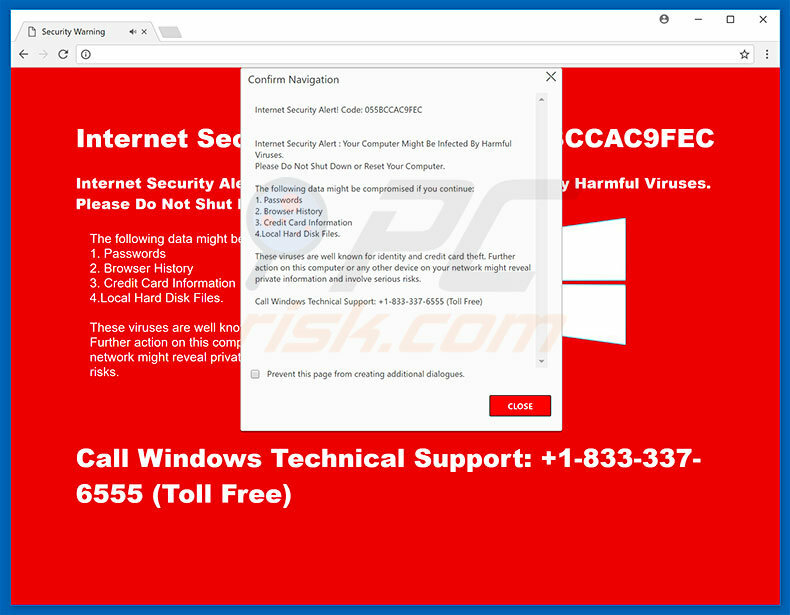 I know the alert page is a scam, just wasn't sure if it was just a redirect or if my computer/browser was infected that caused it to popup. I just remembered I gotten something similar while on Xfinity's home page a few time, which I find highly odd that it would happen on my internet providers homepage. Right. Your PC is NOT infected. "Windows Technical Support" will never contact you. This is designed to get you to call that number. Then, they will talk you into allowing them connection and control of your PC. It IS, "Windows Technical Support", after all. They can be trusted, right? Once they're in your system, he will open up Event Viewer. And show you hundreds of "Events". If there's that many, surely there is a problem. No. It's supposed to do that. "Your framistan valve is bent, and your turn signal fluid needs replacing"
The real unscrupulous ones will also take this opportunity to scour your system for any passwords. And of course, leave behind a remote access tool, to gain access to your system whenever they want. You need an ad blocker. Install uBlock Origin. These things are just stupid ads that Google is too lazy to screen. If there is ever anything truthful about them it is purely coincidence. uBlock Origin is my favorite ad blocker (besides my pihole DNS ad blocker xD) and it works incredibly well. Tweaktown lets this crap on their site? is internet security an antivirus or antimalware? F secures Mikko Hypponen say they and others can scan the whole internet but how much can they, the goverment really see? Kaspersky Total security VS Eset Internet security 2017 and Eset Smart Security Premium? Bitdefender Internet Security 2017 or Bitdefender Antivirus Plus 2017? Send big files over the internet securely. I will uninstall my kaspersky internet security now i want to reinstall kaspersky using previous license. How? Kaspersky Internet Security turned off? What's the best Antivirus and Internet Security program for my gaming PC?